Don’t forget to go over the recommend procedures after installation. If you run into any other issues, use the comments below or the forum! I resintalled both client (4.8.3) and headless server. I let the headless server upgrade to latest version. – client connects to headless server. Why has my configuration lost and how can i retrieve it? Most likely you’re not actually connecting to the server; what you’re seeing is the client’s service instance running. Double check the .ui_info files to see if everything is accurate. Don’t forget that the hash inside the ui_info file tends to change a couple of times or so before actually stay static. I am sure that I am connecting to the headless server because when I click on select files (to backup), it shows me all the files on the server but nothing is selected. This means that i am connecting to the correct service but the cache information about what files need to be uploaded has been lost. Ok – is the backup available through the web restore interface (crashplan.com)? I never checked backup from site before. thanks for that. DESKTOP-JEVUTFC is my client machine. i didn’t finish this upload cause i decided to install crashplan on my synology server instead. dataAJ is my synology server. It was uplaoded completely (about 320 GB) more than a week ago. Now it’s showing size as 0 GB. By your description, your last “good backup” was of a week ago, so I would guess it is related to the second entry on that table. Hit Restore and browse that backup – even though it says “0 files”, if there was data before, it should be available for selection under “check previous versions” or something of that fashion. After you make sure which one is accurate, issue “guid new” from the client and re-adopt the previous correct machine. Thanks. I am going to try that. I click on my second computer and then clicked on Modify settings. I can see the file selection is present here. Let me try your suggestion and post my result here. It’s working now. I guess I wasn’t aware of the adopt option earlier and missed it last time. Thank you! No worries – the concept is often times easy to miss. In any case, what might solve it is to open CrashPlan’s CLI (double-click the client’s logo) and issue `guid new`. 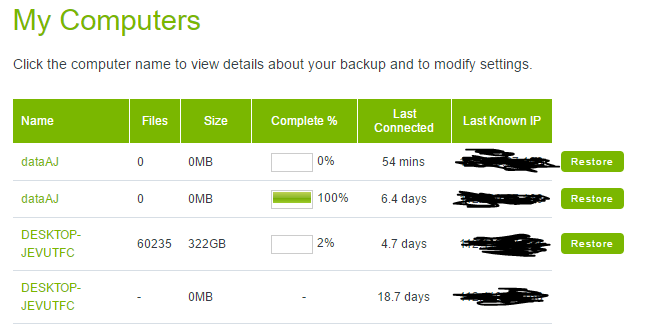 You should be logged out and when back in, use the adopt option to select your previous backup. One more thing – uninstalling the client should not be necessary, it will take care of itself fine, upgrades included. You can even disable the CrashPlan service in the client machine, as it is completely unnecessary. yes, I have disabled the crash plan service on my client already. thanks.